A map of Europe, with ISO 3166-1 alpha-2 codes in place of the names of countries and other territories. ISO 3166-1 alpha-2 codes are two-letter country codes defined in ISO 3166-1, part of the ISO 3166 standard published by the International Organization for Standardization (ISO), to represent countries, dependent territories, and special areas of geographical interest. They are the most widely used of the country codes published by ISO (the others being alpha-3 and numeric), and are used most prominently for the Internet's country code top-level domains (with a few exceptions). They were first included as part of the ISO 3166 standard in its first edition in 1974. The ISO 3166-1 alpha-2 codes are used in different environments and are also part of other standards. In some cases they are not perfectly implemented. Starting in 1985, ISO 3166-1 alpha-2 codes have been used in the Domain Name System as country code top-level domains (ccTLDs). The Internet Assigned Numbers Authority currently assigns the ccTLDs mostly following the alpha-2 codes, but with a few exceptions. For example, the United Kingdom, whose alpha-2 code is GB, uses .uk instead of .gb as its ccTLD, as UK is currently exceptionally reserved in ISO 3166-1 on the request of the United Kingdom. The WIPO coding standard ST.3 is based on ISO 3166-1 alpha-2 codes, but includes a number of additional codes for international intellectual property organizations, which are currently reserved and not used at the present stage in ISO 3166-1. 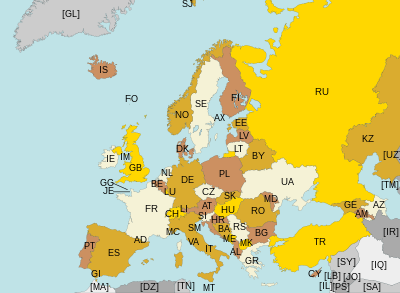 The European Commission uses ISO 3166-1 alpha-2 codes with two exceptions: EL (not GR) is used to represent Greece, and UK (not GB) is used to represent the United Kingdom. This notwithstanding, the Official Journal of the European Communities specified that GB and GR be used to represent the United Kingdom and Greece respectively. The United Nations uses a combination of ISO 3166-1 alpha-2 and alpha-3 codes, along with codes that pre-date the creation of ISO 3166, for international vehicle registration codes, which are codes used to identify the issuing country of a vehicle registration plate; some of these codes are currently indeterminately reserved in ISO 3166-1. IETF language tags are also partially derived from ISO 3166-1 alpha-2 codes. The following is a colour-coded decoding table of all ISO 3166-1 alpha-2 codes. Click on the cell to see the definition of each code. UN/LOCODE assigns XZ to represent installations in international waters. The Unicode Common Locale Data Repository assigns QO to represent Outlying Oceania (a multi-territory region containing Antarctica, Bouvet Island, the Cocos (Keeling) Islands, Christmas Island, South Georgia and the South Sandwich Islands, Heard Island and McDonald Islands, the British Indian Ocean Territory, the French Southern Territories, and the United States Minor Outlying Islands), QU to represent the European Union, and ZZ to represent "Unknown or Invalid Territory". The code XK is being used by the European Commission, Switzerland, the Deutsche Bundesbank, and other organizations as a temporary country code for Kosovo. Reserved code elements are codes which have become obsolete, or are required in order to enable a particular user application of the standard but do not qualify for inclusion in ISO 3166-1. To avoid transitional application problems and to aid users who require specific additional code elements for the functioning of their coding systems, the ISO 3166/MA, when justified, reserves these codes which it undertakes not to use for other than specified purposes during a limited or indeterminate period of time. The reserved alpha-2 codes can be divided into the following four categories: exceptional reservations, transitional reservations, indeterminate reservations, and codes currently agreed not to use. IC Canary Islands — Reserved on request of WCO for area not covered by European Union Customs arrangements. For each deleted alpha-2 code, an entry for the corresponding former country name is included in ISO 3166-3. Each entry is assigned a four-letter alphabetic code, where the first two letters are the deleted alpha-2 code. WIPO Standard ST.3 actually uses EA, instead of EV, to represent the Eurasian Patent Organization. However, EA was already exceptionally reserved by the ISO 3166/MA to represent Ceuta and Melilla for customs purposes. The ISO 3166/MA proposed in 1995 that EV be used by WIPO to represent the Eurasian Patent Organization; however, this request was not honoured by WIPO.